Photo courtesy of Carol Knox. Sandy Spencer touched the lives of many. I knew her as a cellist: she played in the Cape Cod Symphony Orchestra for many years, and she taught cello to young and older at the Cape Cod Conservatory. She was particularly warm and supporting of adult beginners, helping them to overcome some of the many challenges of playing this difficult instrument. She would tell her students to hug their cellos, an act that would not only reaffirm their commitment to the cello, but would help to release tension and help improve their playing position. I met Sandy in 2004, when I began taking cello quartet classes in the conservatory’s Summer Strings program. She coached several quartets, and I started out in the beginning group, but what a joy it was to play with other cellists! Eventually the conservatory offered year-round quartet classes with Sandy, and I attended for several years. We named our quartet Cellobrations, a nice play on words, and an expression of the fun of playing together. This past fall a group of Sandy’s students from several of her quartets got together under the direction of Pam Mittendorf, one of her quartet students, to play classical and Christmas music at Sandy’s church and in two assisted living locations. 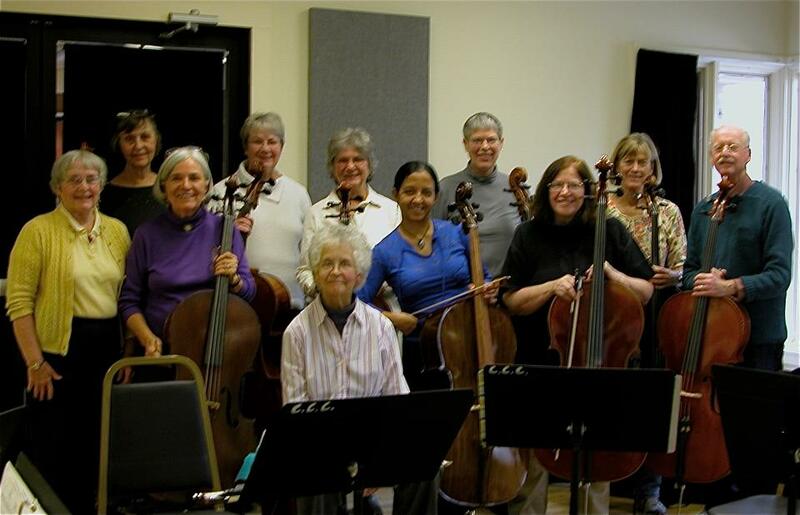 Sandy was, by then, too sick with cancer to join us with her cello, but she came to one of our rehearsals, and smiled through the whole thing. I hope we made her proud. Sandy died on January 15. She was 76. She will be missed by her students and friends, and by those lucky enough enough to have heard her play the cello. Thank you Sandy, for your music and your friendship. Rest in peace. There will be a memorial service for Sandy Spencer at 2 PM on April 29, 2012. Family and friends are invited to attend. It will be at the Quaker Meetinghouse, 58 N. Main Street, in South Yarmouth. A reception will follow. 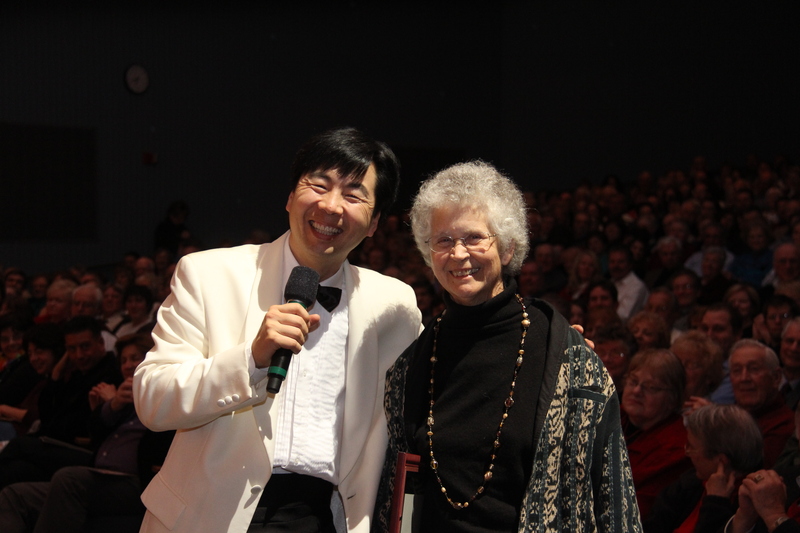 Jung-Ho Pak honors Sandy Spencer at a CCSO concert in December 2011. Beautiful article for a very beautiful lady. The world will miss her. Thank you Marilyn for writing this. I am so sad to hear this news. Sandy and I played together in the group “Mormos”, based in Paris, France, in 1971-73. She also recorded with me on some projects when she was here in the San Francisco area in the late 70s. Her solos on the Mormos recordings were simply astounding, because they were very jazz-oriented and totally improvised. I also have some live recordings from the times in Europe; I will have to dig those out and perhaps make them available for her fans. Hi Ernie, Thanks so much for writing. I did not know about that musical side of Sandy, and I appreciate your letting me know. I found Great Wall of China by Mormos on YouTube. Is that Sandy? Do let us know if you make the recordings available. I am sure many on Cape Cod would be interested. I,too played with Sandy in Mormos and visited her on Cape Cod. I don’t live too far (a 7-hour drive) and would love to come to the memorial. Please send details. (Continues) I don’t know how much Notes on the Arts knows about Sandy’s earlier life in the Arts. Around 1969-71 she played in the “house band” for La Mama Theatre in New York City. Later that group migrated into what would become “Mormos” and landed a recording contract in Paris. After Mormos, Sandy performed in France and England with other musicians, and toured with John Renbourne, a fairly reknowned fingerstyle guitarist in England. She also used to sing and play the cello, and had some unique solo recordings. I will try to see if I can find any of those recordings to post for anyone interested. She also worked with composer Jim Cuomo in France. Yes, Great Wall of China (the Mormos album) is Sandy playing. That is the title song but also the name of the album. Annie, I hope you can make it to the memorial. Thanks so much Ernie and Annie for getting in touch and for sharing this information and introducing me to this music. I have updated the blog post to include information on Sandy’s memorial service. All are welcome to attend, and I look forward to meeting you Annie. I wish I had known Sandy then. Thanks so much for sharing this. It adds so much to our understanding of Sandy.